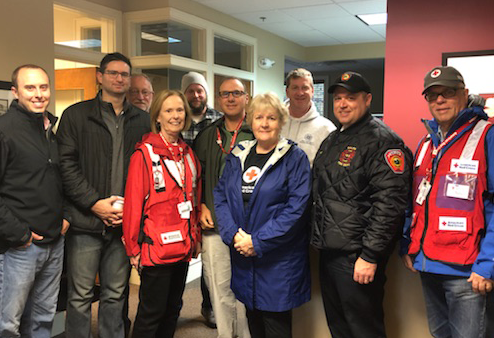 The Greater Salem NH Rotary Club was excited to kick off their joint venture with the Red Cross on the Home Fire Campaign on Saturday Oct 20th and 27th. The 20th they worked together with the Red Cross at the Salem NH Fire Dept Open House to sign up residents that needed smoke detectors installed. On the 27th, three of our newest Rotarians helped install 25 smoke detectors and 6 carbon monoxide detectors at 6 homes in Salem. Moving forward we will be working in all five of our communities: Atkinson, Hampstead, Pelham, Salem and Windham. targeting the senior centers and using social media as well to get our word out! The Home Fire Campaign is a National initiative with the Red Cross, so if you have friends or family throughout the US that might need their help, encourage people to contact their local Red Cross to get scheduled!